Television presenter Esther Rantzen challenges her daughter, and fellow presenter, Rebecca Wilcox in a competition for antique glory in and around Reading. Browse content similar to Esther Rantzen and Rebecca Wilcox. Check below for episodes and series from the same categories and more! We are special, then, are we? We're a very good team, you and me. Their mission, to scour Britain for antiques. -I've no idea what it is. The aim, to make the biggest profit at auction. -There is no accounting for taste! 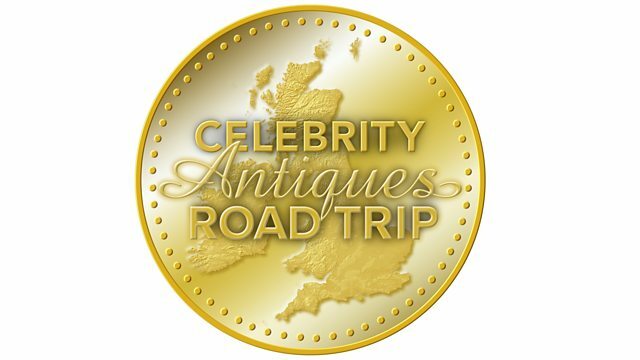 We're in the Thames Valley for a celebrity road trip with TV aristocracy. Oh, look, there it is. Presenter Rebecca Wilcox and her mum, the iconic Esther Rantzen. It promises to be the mother of all contests. Do I get that from you, or do I get that from Dad? I think you get that from yourself, Rebecca. I don't think on this occasion you can blame either parent. I'm not, I just effortlessly win things. TV screens for over 40 years. Most famously in That's Life. She always combined fun with being the consumers' champion. the ground-breaking service for children and young people. Today, Esther's a rather nervous passenger. Keep your eye on the road. My eye is on the road! You will tell me if I'm heading off into a ditch, won't you? Desmond Wilcox, Rebecca's forged her own career in front of the cameras. is as easy as falling off...a sofa. she defers to Mum for advice. and that you would want to live with in your home. How do I know that you're not trying to give me misinformation? Because I'm a warm and caring mother. profits from antiques. They're going to need trustworthy advice. Sounds like a job for experts, David Harper and Will Axon. do you think she's going to be looking for the ridiculous? I know what you're going... I know where you're going. of a rude bit - a carrot! That's the one. A misshapen spud. Well, it would be the first on the show. Auctioneer and valuer, Will, specialises in conventional pottery and furniture. David pairs up specialist antiques with buyers and auctions. preferably bigger than this 1966 Mini Cooper. It's a good job we're both slim chaps. Slim and trim, Will, slim and trim. Today's road trip begins on the outskirts of Reading in Berkshire. Hi, Rebecca, David. Nice to meet you. How'd you do, I'm Will, nice to meet you. As the celebrities arrive, it's time to declare the teams. -I see you are in your cyclamen? So, that's the pretty in pink team sorted. What do you think of the cars? and we are perfect for this rather stately one. I feel slightly judged but I think that's great. I think that's much cooler. and the short journey is a chance to assess the opposition. -We'll fight them to the death. -I'm not competing with her. Is that because there's no point in competing with her? -Well, it's because I want to disarm her. And then see if I can win in spite of her. Devious... And what about shopping style? It's very difficult to judge who's going to be in the auction, etc. that you would buy yourself. The first place to test it is at Fanny's. It's home to about 20 dealers with an eclectic mix of wares. Today, Will's the man keeping an eye on it all. -I've watched you for many years. Ah, and there's a lot to look at. Do you do this, do you wander around places? I haven't done this since my husband died. -We used to do it a lot. and then that would always remind us of the day. Esther's soon back in rummaging mode. I've got to get me glasses. And going for what she likes. Oh, look, wait a minute, there's a pig. -Now I'm very partial to pigs. What is it that you're drawn to, though? Well, it's got lots of animals. God! There are animals everywhere I look. We've got a bit of an animal theme going here with Esther. With anything to do with animals, she's in there. Stick your nuts in there. I won't. Stick your own nuts in there. It doesn't matter whether they are brand-new, or any age at all. Look, I've found an elephant stool. on something with age and quality and distinction. It could be an uphill battle, David. Fortunately, it looks as if Esther's taste extend beyond animals. Do you want me to help you there? If I knock everything off this shelf, will we have to pay for it? That's lighter than I thought it was going to be. Well, well, well. -OK, a piece of glass. -Some glass, I like that bit. Can you pronounce that beautifully? Jean Noel Bouillet, Objet D'art Signe. and a £55 price ticket. I love it because all Art Glass is individual. It's a bit like you, Esther Rantzen. There is only one Esther Rantzen in the whole world. -You may say, "Thank the Lord!" -And there's only one of them. -I think it's rather gorgeous. -How much would you pay? You're very hard, aren't you? -You know, I've never haggled in my life. -I think that would be 20 to 30 in auction. I think it's very, very stylish. -Shall we get a price on it? some negotiating. Go for it. That's 55, that's about 60% discount. Somewhere in the middle, 30? -You've done it, you've done the deal. Well, you're wonderful, thank you very much. With a reduction from £55 to £30, Esther's bagged her first bargain. It's modern but there's not an animal in sight. Phew! I'm the most indecisive person in the world! -This I do not like. We are going to have to make quick decisions today. to the Hampshire village of Eversley. -I don't know where to start. A first peek in the cabinets yields a possibility. where you'd put your little flowers. which is quite stylish on its own. -You did say you were indecisive. -Well, you're not indecisive about that? I don't know what I like. I know that I don't know but I don't know what I know. So, just to clarify, that's a known unknown. -Is that painted, or printed? Painted... Stop me when I'm right. uses a combination of both techniques. It was probably made in Bohemia in the late 1800s. With a ticket price of £30, could it provide a rhapsody? I don't want it if it doesn't set your world on fire. So it that a decision? Are we saying no to that? -We'll keep it in mind. Ah, a decision not to make a decision. of buying what she likes, no matter what it is. -Oh, how he would love that. and then abominable in another. It is new and probably made in China. Stick it on the floor down there. -What am I, blinking Arnold Schwarzenegger? It's that cyclamen shirt, you see. You're not going to, are you? You are. -Esther, you'll never get out. Well, it's not a sensation that I would do very often for fun. You know, my life is complete. Let's not go there, eh? -Do you want a hand out? that really floats David's boat. Something finally with a bit of age. Would you like to try it out? It's this chair. This American rocker dates from around the late 19th century. but the frame is made from durable beechwood. -Tell me what your thoughts are? Excellent, I'm loving that attitude. -OK, it does get better. -It's just a super piece of kit. -I'm not convincing you, am I? I think it's worth about 35/40 quid. -OK, would you pay that for it? Unimpressed, Esther carries on browsing. Undeterred, David tracks down Will. needing a little bit of restoration. What's the absolute double-death best price? The death on that would be £25. OK, leave that with me for a moment. -Very pretty. I like that. -If someone gave me that as a present, I'd be thrilled. -So you actually like it? -I really do like it. and with a ticket price of £22, it's a possibility. But, first, David has unfinished business with the rocker. You said you would pay, if you went mad one day, 35. -What if I said we can get it for 25? but at £25 even she can turn a blind eye. Erm, what could that be? Bearing in mind, we've bought the chair - big spenders. -Can it be ten quid? My gosh, we're on a buying fest! all snapped up for a total of £67 in Esther's first shop. Over at Eversley Barn, indecision is the name of the game. and Will's diverted to another option. and it tells you exactly who it's by under there. -Is that somebody I should have heard of? architect and designer who worked at Wedgwood in the 1930s. He's known for his very restrained take on Art Deco style. It has come down to £135 because, obviously, they can't sell it. What do you reckon? Get it for 70? I think if we could get that for £100, we could stand a chance. Got to put the face on, got to put the face. Rebecca's on the brink of a decision. Nobody get in my way! ..and how dealer Hillary reacts to them. -What would be your best price? Oh! She's good! I haven't even had a word. -It's all your own work, this. -Would you go for a nice even 77? -77. We've got to, haven't we? reduced from £135 to 77. On a roll, Rebecca decides to try for the Bohemian glass tankard, too. -It's only got £30 on it. -I know. It's not a lot to start with. -You are going to go for 20. 22 and I will. Don't push it. She's playing you at your own game now. I think you should say yes. 77 and 22. That makes a lovely 99. -Pay me 100 if you like! -It's in the stars. Shake hands. reduced from £30 to £22, Rebecca and Will have two decisions made. -No, thank you. It's been good fun. and opponent is getting on with her purchases. She says she's only brought a Faberge egg and a Rolex. -I like your style, Rebecca! a subject close to Esther's heart - children going through tough times. devoted to the upheaval endured by child evacuees during World War II. -Hello. Martin Parsons. How do you do? Professor Martin Parsons has studied their experiences. thought to be in imminent danger from bombing of British cities. They were only allowed to take the bare minimum. "one pair of trousers or shorts. "Girls - one vest or combination..."
-You know what combinations are? -I can remember them well. "One pair of knickers, tunic and blouse or dress. "You're going to need more than one change of clothing,"
when they got on the train with a gabardine mac. -And that weekend was notoriously hot. and they were on the trains for nine, ten or twelve hours. If you're sitting there with a bag of food, you're going to eat it. -You're not going to say they threw up? And so some of these children got to the other end and they were in a hell of a state. in the countryside but that's actually not true. were the labouring classes, the agricultural labouring classes. -who had come down from the cities. and they would have had candlelight. For some children, the distances and the culture shock were even greater. 19,000 were sent overseas through private arrangements or by the government. -a prosperous South African family. -How old was she there? -Here's a telegram dated 3rd October 1940. So, she had sent a telegram from South Africa? Yes, to say she had arrived. -when she comes back at 17. -Right. And was she happy? -And did it change her life? because until recently, she wouldn't even talk about her experiences. and felt like a stranger in the house. and had a long wait to be reunited with her family. 14th of January 1946. "Thursday. Cheers! Meet in Waterloo station. and within the UK, there were many happy ones, too. retired back to where they were evacuated to during the war. -Well, that's a good thing. with good memories for them. That's lovely. Well, that's brilliant. -I feel very privileged to have seen them all. what it's like forging a career in the shadow of a famous mum. -I'd say that it was Joanna Lumley. -Which sometimes people believe, which is quite nice. There is something, yeah, there's something of the Patsy about you. "I use to lie and pretend you were my mum." She looked horrified! where they are hoping to find more booty at White Lion Antiques. With lots to look at, Rebecca and Will split up to search. But Rebecca's not sure about going solo. I'm a bit overwhelmed. Don't know where to start. This place is enormous. Look, it goes on. I have to make decisions. Denby. Denby. I've heard of Denby. Haven't I heard of Denby? Denby's good, isn't it? Is it supposed to do that? OK.
Mum's probably doing brilliantly by now. and she's haggled down the price. It's as if you've known her all your life! Bamboozled by all the options, Rebecca ropes in Will for advice. Are you trying to suggest that I'll be your monkey while you grind it? -Yes! You're my organ grinder! That's the only problem with it. -It's quite dramatic, isn't it? -I think it's a horror movie. It's made in Spain so it could be a well-known flamenco number. -Yeah. How is your offbeat clapping? -I really wish I hadn't done that. Ole! Will's rummaging has turned up a textured Art Deco style vase. -I don't know. It just had a funky sort of finish to it. It's weird, isn't it? It's not signed, that's the only thing. I'm wondering where it could be from. -It could be an anonymous gem. It's got £68 on the ticket. -You need to get that for, like, £20, really. -I've seen you in action. -If anyone can do it, the Becmeister can. -We'd like to pay £20 for that. -You hurt him! I felt that from here. I mean, it's been there a while. It's very dusty. -Tucked away in the corner there, unloved, it was. -Well, it's up for 68. Why don't we say 50? I told you the truth. My upper limit was 20. -25, and that will be...that is it. Jerry sees an opportunity for another sale. with a mirror, hairbrush and clothes brush at £125. -That's not a sight anyone wants to see! It's got something about it. It's not English. -I do. I do think it's beautiful. -What would be your best price on that? -You get the better end of the deal at 75, Rebecca. -You are a lovely man. Well done. She is good, isn't she? I told you. Rebecca is a natural, landing a £50 discount with ease. so for now, teams, night-night. It's a new day and Esther and Rebecca are comparing notes. -I'm getting my eye in. Are you OK? -Really? I feel like I know nothing. I severely regret some purchases. Now, funnily enough, I don't regret any of mine. -I'm rather pleased with mine. -You're sounding really supremely confident. Well, let assess who's entitled to feel smug, eh? Yesterday Rebecca had trouble deciding on anything. and it leaves them with £201 still to spend. Go on! Go on, the Becmeister! Esther made a beeline for what she likes. -Hunting through modern, mass-produced goods. I have a two-year-old grandson. How he would love that! Art Glass vase, a rocking chair and a 19th century Imari plate. They spent just £67 so they have a whopping £333 left to spend. -I like that jacket, that's very smart. Mum has scared the life out of me. She's supremely confident. -And how are you feeling then, today? -Shall we hit the road? Let's hit the road, come on! David is wondering how Esther got into presenting. -to put the researchers into the programme so there I was. So it was a shock, then? It was a surprise to you? -And it was never planned. after a short drive along the Thames to Goring. and everything from antiques to bric-a-brac. and now she needs help from owner, Mandy. this grandparent would be delighted. So, what's here that's suitable for a grandchild? I'm irresistibly... "Present from Morecambe". -I'm irresistibly drawn to crap. but it's hard to tell whether they are originals or prints. I'm thinking it's a watercolour. I can see the pencil underneath. Actually, I think I'm with you. I think they're proper watercolours. And very, very sweet. and depict a sequence of nursery scenes. -The set of four is priced at £75. They would be lovely in a nursery. Wouldn't they be lovely in a nursery? I think they're gorgeous. I think they are gorgeous, actually. -I know. I can't believe we are agreed on something. -Because we've got to beat them down. -Listen, we really don't like them. Enthusiasm is a strategic error but at least they are agreed. -Now it's all down to price. -So, what are you thinking? OK, I'll take £30 off. That's it. How did that happen? I think we've just bought them. Well done. -This is a new method of negotiating. -Well, look, it's tenner each. and a priceless outbreak of harmony between Esther and David. Meanwhile, Rebecca's still rueing yesterday's shopping. I hate the glass tankard with the enamel that I made us buy. I have no idea why I did that. It was some weird possession of some nutty, bad taste spirit that got me. Do you know what? I bet that makes the biggest profit. Soothing words, Will. Happily, there is another distraction at hand. which has a collection of material relating to publishers Mills and Boon. and Rebecca is well qualified to enjoy them. Actually, I have read a ridiculously revolting number of them. -I used to try and write them with my sister. -and love with the manor lady. a PhD student who is researching the archive. Do you think they are unfairly disparaged? -That they are actually high literature? and the publishers didn't say that it was high literature. in 1908 by Gerald Mills and Charles Boon. and focusing on escapist romances for women. The readers took them very seriously. to buy a new copy. in the readers' letters, to go and buy one. So people were taking them very seriously, the writers took them very seriously. I think what Mills and Boon were wanting to do was to publish the best romance that you could do. The company always encouraged and nurtured female authors. reflected the changing role of women in society. the women are starting to kind of have more professions. So, this is a kind of really good example of an author writing then. This is Betty Beaty. She was actually living the dream. and, of course, she met her husband, who was a very handsome pilot. There were also a lot of other women who had dreamt about writing a novel. Someone like Violet Winspear, who started writing in the 1960s. earned a reputation for passionate stories and exotic locations. but had strong views on what romance should be. it shouldn't be like bacon and eggs on a plate. and that's her view of it. the permissive society of the '60s changed what was acceptable. Violet tried hard to give readers all they wanted, but not too much. are heroines still to be virtuous? and how far it should be kind of left ajar, or should it be closed? the publishers did allow themselves a bit of fun, too. because they've taken some of the things out of context. "I have never been intimate with a bear," she said with a sniff. "There's always a first time." So it's just full of wonderful things. -I have no idea what that means. "These lips are my sacramental wine," he murmured. that not even the blade of an espada may sever. -A bit of Spanish in there as well. Romantic. Can I just say, it's been very informative and good fun. -And as a fan, I loved it. -Thank you for letting me share it with you. to the Oxfordshire town of Wallingford. for the throne between Empress Matilda and her cousin, Stephen. where Siobhan is one of the dealers. -I'm Esther. Hello, how do you do? -Nice to meet you, Esther. Esther and David still have £288 to spend. That is a treasure trove, is it not? After a little rummaging, David strikes gold. ..hideous pieces of china I've ever seen in my life! This is the chalk and cheese team. Perhaps Esther is better off finding her own treasures, hey? She is feeling the pressure. -The fiendish desire to win. -The competitiveness is now coming out. The real Esther Rantzen has arrived. The real Esther Rantzen needs help, David. So, what do you suggest? Here we have a cigarette case. I know it's not that PC but it could be used as a card case. but that's the interesting thing. -Gilded interior and it's hallmarked for 1939. -That's more than interesting, that's brilliant. -It is quite brilliant, actually. It's got a fantastic history. aged 19, you know, with probably his little self-rolled cigarettes. -..it more than likely saw action during the Second World War. The case seems promising, but it's not priced. What kind of figure can you do this for? I could do that for £60. -No, I'll do 55, and I think you'll do well. and for Esther, it's not all about profit this time. I have met Battle of Britain pilots. and I'm Jewish, and I wouldn't be here if they had lost. my family wouldn't be here. -So they mean a heck of a lot to me. Well, I think we have to go for that. That is so powerful that we have to have this. So we've done it. That's our final object. -Siobhan, please shake my hand. but at £55, their final lot is secured. "romantic interlude" in Reading to meander down the river to Henley. in straw boaters and stripy blazers today. Rebecca and Will have £201 left to spend. Tudor House Antiques could be the place to do it. and Dave and Patrick are on hand to help. -Hi, how you doing, all right? -I'm Dave, pleased to meet you. Will scours the back yard while Rebecca searches indoors. Ooh, it's got a... Oh, how nifty! I think that's old. I'm going to get Will. Gosh, a new decisive Rebecca! -Come and have a look at this. -Don't get your hopes up. is a type of coal scuttle named after its inventor, Mr Purdon. As you were. No decision. That's a quirky item, isn't it? because it's high summer, and what am I looking at? A sledge. If I give Will another musical item, he'll lose all faith in me. But not any old sledge. This is what they call a flexible flyer. and they've got some great steering at the front there. but I don't know. How's she going to take it when I tell her? -There's no time like the present to find out. ..a sledge better than that? You're not impressed, are you? Can't say I'm feeling it. It's a proper bit of American folk art. You genuinely think we can make money on it? -but it's just whether the market is there in Woking. In summer, for a sledge. No, we'll leave the sledge. -I can tell you're not enamoured by the sledge. If not, there is a lovely little box that I saw, a lacquered box. and Will's introducing a third? A little Japanese lacquered box. -Look at the quality, look at the workmanship. -That's all done by hand, you know. The box probably dates from the 1920s or '30s, and it's £22. Why don't I like it? What's wrong with me? could easily make 40, 50, maybe 60 quid. -because now I really like the sled in comparison with that. -And what about your coal bucket? -No, I've gone off that. but there's still trouble reaching a decision. We're in a dilemma, aren't we? -You said you were indecisive. See, I would never buy the box. But now I would buy the sledge. I wouldn't have before. -No. I was like, "What? Rubbish!" -Oh, let's throw caution to the wind and buy the sled. Yeah? Go on, then. You stay here, I'll go and get it. Now, there's still the crucial matter of the £48 price ticket. -Oh, that's the best item in the shop. -I knew you'd say that. But, it's the height of summer. We're trying to sell a sledge. What's the best price you can do? -I could do it for 40. 35 and we've got a deal. Go for 33 and you'll make me really happy. -You're a sucker for a pretty face! as the teams reveal all? Talk them through it, Becca. So, beautiful vase, possibly 1920s. -This is a Keith Murray for Wedgwood. -Then this is all Becca's doing. I see, you're passing the blame already, Will. Well done. -This is the one that's giving me nightmares. Because it's not particularly beautiful and it's not worth much. Did you pay much for it? We paid, for that, £22. -Oh, that looks good fun! It's an American piece and I have seen them make good money. Could I just make a point? Esther Rantzen is so quiet, this is unbelievable. when I've brought certain men home. It's not good! Come on, Esther, pass judgment on our treasure. I think you've tried really hard. -We all know what she really means. and there's her honest truth. because otherwise I might think they were exceptionally dull. I've no idea who madam is. But, but, I could be completely wrong. -Yeah, it's time to show yours. Get ready to be criticised now. Oh, look, they went for art! What have we got down there? -Even I'm impressed when we unroll this. - OK, so... - Talk us through it. and they might like to decorate a nursery and it would be perfect. I think it would look lovely in your nursery, actually. I'm supposed to be nasty, I'm supposed to be, "Oh, it's horrible!" -That is a cigarette case but it would double as a card case. Well, I think it's a really eclectic, interesting mix of stuff. With no punches pulled in public, what will they say in private? -Woking, in the summer - excellent news. -The tankard was peculiar, wasn't it? Would you swap all of their items for all of your items? Oh, come on. Fist bump it out. Can't carry that off. Not street. As auction day dawns, Esther's raring to go. I am so excited about the auction. I absolutely adore auctions. because I would bid for everything. How are you feeling about it all? I've never been to an auction. so it's on with the show. Anxious, because I fidget, I'm going to accidentally bid on something. -Oh, don't! You've got to sit on your hands and don't blink. Because if you blink, you spend money. -Anything can happen. Come on. and fine art auctions as well as a range of specialist sales. so what does he think might happen? I think the sleigh is going to be of interest. It's a novelty item, it's well displayed. The glass vase, I quite like. It's got the certificate there. If I had to pick a lot - I like the silver dressing table set. that away, certainly it should make 50 or £60. Tankard, yeah. It's a bit boring, £10 would be lucky. Each of our teams started with £400. Esther listened to David's advice then followed her own instincts. spending a paltry total of £167. shelling out a much heftier £232. Will is doing nothing to soothe Rebecca's nerves. -Good luck, David. Good luck, Esther. -RAF cigarette case hallmark for Birmingham 1939.
joined the RAF in 1939 - just before the Battle of Britain. -This is a very important lot. You weren't expecting that, were you? Should I say "That's Life!" At 35, 40, 45, with you, sir, in the doorway. 75. 80. 85. £80 in the doorway. At £80 for the last time. Aw! £80. It is a trickle. Thank you for the trickle. I call £25 profit a very reasonable start for Esther and David. I tried to pull her down but almost got her trousers! -That would have been brilliant! and mirror set fancied by auctioneer Tim. £30 for it. £30 bid. And five. 45 now. 45. 50. 55. 60. 65. At £60. Are we all done? -It's not as bad as you thought. A classy choice but an unlucky debut for Rebecca. Are you enjoying your auction experience? Will and Rebecca's Keith Murray for Wedgwood set is next. Will the bidders rate it delightful or dull? Don't bid! I thought you were bidding. At 50. Looking for 55. -60. 65 online, if you want it. 60 in the room. At 65. -Come on, £70. Worth it. 75 online. 75 online if you want it. It's gone quiet online now. At £70. Yes, another small loss and a bumpy start for Rebecca. But this still plenty of time to turn things around. It's a bit of a loss, not much. But we haggled hard for that. Next up is the 19th century Imari plate found by Esther. -It's Japanese. £10 for it. He's working on their side. -Come on. Esther, do something. 15, I've got. And 20, madam. -25. Battle of the ladies. -Come on, you miserable lot. At £25. With you, madam. Selling to the room at £25. Rebecca has realised she's on the back foot. It's because people love you. They don't know who the hell I am. Rebecca and Will both liked the glass trumpet vase. Now they need the bidders to feel the same. You could use it for a hospital sample. -It looks like it already has. £20 for it. Bid me ten. Come on, surely £10 at the back. 10 is bid, I'll take 15. The right people just weren't in the room, Rebecca. Whoever bought that, you might get a quick profit in the car park. After a series of losses comes the lot that worries Rebecca most. -The Bohemian tankard she chose. -£30. 10, if you like. 25 online now. Battle at 30. -and turns around her fortunes. Ester discovered the French studio glass vase. Will it be a oui or a non, from the bidders? 25 now. 30 bid. 35. At 45, selling at £45. Esther and David's profits are rising slowly but steadily. -We are trickling all the way. -We are leaking all the way. Come on, a nice item, this one. £100. 50 for it. 55, 60. 65. 70. 75. Looking for 80 anywhere. At £75. The bids are out. The back of the room, £75. and Will right back in the running. Now she's happy. Was she like this as a child? Next up is the American rocker. Hideous, according to Esther. You would have to pay me to buy that. -That was 20 he was bidding. He said 20. I heard him say it. -Come on. Come on. Come on. -At £30, it is with you. Yes! Go on. You realise it has no cushions. But how much will it be worth with cushions? Hm, not so hideous when you consider that is a decent profit, Esther. -Believing in the American rocker. snap up the final lot, the four nursery pictures. -Good and decorative. £30. You pay that for the frame. Bid me 20. 20 bid. 25 behind you. Looking for 40. At £35. I'm glad you had one. -but only a modest 10 down. I wish they had had more pain. Good stuff, shall we hit the burger van? Let's check the ratio of pain to profit. but after paying auction costs they made a small loss of £18.80p. It leaves them with a total of £381.20. a total of £417.50 and victory on this road trip. All profits, no matter how small, go to Children in Need. No, you always thought that, Becca, all the way through. I was fine. I am not at all competitive. -She's going to be intolerable. -She's now an expert. Teeny tiny win. -I've got to get in the car with her. Thanks for your help, David. If somebody asked me to do a whole week of this, I would jump at it. Television presenter Esther Rantzen challenges her daughter, and fellow presenter, Rebecca Wilcox in a competition for antique glory in and around Reading. Rebecca delights in diving into much-loved romance novels and Esther hears the moving stories of British evacuees during World War II.